One pound equals 3,500 calories. No matter how you look at it, everything comes back to this equation. It’s sort of the E=mc2 of dieting. If you want to lose ten pounds in ten weeks, you must burn 500 calories more per day than you’re eating. Don’t want to cut out that guilty-pleasure Reese’s Cup? Step One: Consult your doctor. Don’t skip this step. While WebMD hails losing one or two pounds per week as sensible (http://www.webmd.com/diet/guide/choosing-weight-loss-program), everyone is different. Check with your family physician to make sure you’re healthy enough to reduce calories and increase exercise. Step Two: Determine how many calories you eat. This chart is based on women with a moderate amount of activity in their lives. (Men should check the site for their chart.) If you lead a sedentary life, subtract calories from these amounts. Step Three: Create a food/exercise diary. 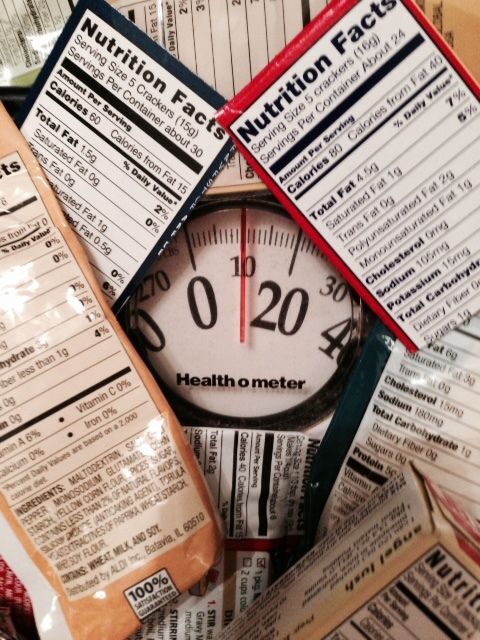 Google food diaries on the web and you’ll find a myriad of calorie-counting journals. A relatively easy one is www.Fitday.com, but a simple pen and paper can do, too. If you absolutely abhor counting calories, don’t be discouraged. Most of us repeat the same exercises and eat the same meals in a one-month period. Within a few weeks, you can become extremely good at counting calories in your head. Step Four: Design your caloric wardrobe. To lose ten pounds in ten weeks, you have three choices: 1) eat 500 calories less per day than what is stated on the chart above, 2) burn 500 extra calories per day by adding exercises listed below, or 3) mix and match a combination of the two. 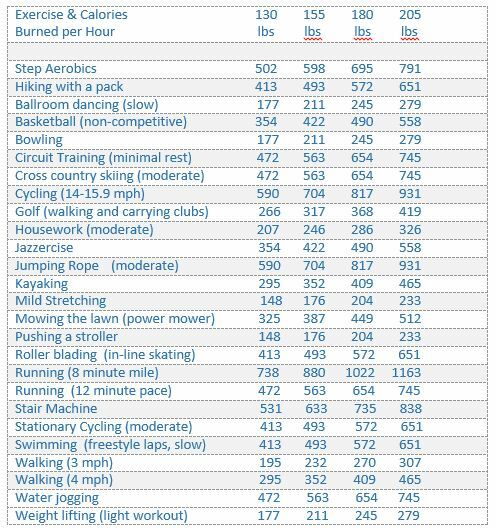 If you don’t see your favorite activity or you weigh less than 130 pounds, check out http://www.healthstatus.com/calculate/cbc . Enter your weight and the number of minutes you performed your favorite activity and Health Status will calculate your calories burned. Swim 30 minutes in the AM; mow the lawn 60 minutes in the PM. Jump rope 15 minutes in the AM; walk 45 minutes at lunch; cut out 200 daily calories. Follow 30 minutes of running with 30 minutes of cycling after work. Cut 500 calories from your daily intake and take a day off of exercise. Take a one-hour step aerobics class in the evening. Enjoy a two-hour kayak excursion or golf game with friends on the weekend. Roller blade for 60 minutes; cut out 100 daily calories. If you are new to exercise, it is best to start out slow. You’ll have to eat 500 less calories on your days off, but it will help prevent injuries (and burn out). Ravished from the added exercise? Take a bag of baby carrots to work, keep celery sticks and sliced cucumbers on hand at home. These low calorie snacks will stave off hunger pains. Watch for a future Athletchic article H20? How Much Do We Really Need? However if you’re like me and can’t stomach that much water immediately before and during exercise, then you’ll need to hydrate earlier in the day and drink what you’re able during exercise. Marathoners know the drill—hydrate, hydrate, hydrate the day before. Popsicles, low-calorie chocolate pudding or fudge bars will satisfy any sweet tooth. For a filling sweet treat, mix 80-calorie strawberry yogurt with four tablespoons of low-fat cool whip in a bowl. Good luck and let us know how you do. Athletchic would love to hear your success stories! Please share or ask questions in the comments section below! _________________________________________________________________________ Cyndie Zahner is a free lance writer and author of The Suicide Gene and Dream Wide Awake. Read excerpts of her books here. Read her blog and paranormal experiences on her website. Follow her on Twitter at @tweetyz , or Instagram as cjzahner.